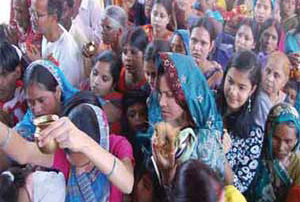 Chaitra is the first month of the year according to the lunar religious calendars. It starts with the new moon in March or April. The spring festival of color, Holi, is celebrated on the eve of Chaitra. The first day marks New Year's Day. Government and businesses are open since it is a restricted holiday. There is no set date in the Gregorian calendar for Chaitra which is the beginning of the Hindu New Year. It is associated with the coming of Spring.